Perfect KETO is a really cool company that I learned about a few years ago. This brand makes all of the ketogenic products and makes the KETO theme the central rallying cry of their brand. They are basically the only keto-first supplement/nutrition brand, and I do give them big props for that. These guys make things like collagen protein, vegan protein powders, and of course their new KETO bars which I need to review ASAP. But of course today we are focused on their pre workout energy product, Perform. I guess the best place to start here, is with the flavor. Perfect KETO Perform comes in one flavor: Lemon. But how does it taste? Perfect KETO Perform Tastes Pretty Bad. Not Gonna Lie. Guys- you know I shoot you straight on taste. When something tastes absolutely freakin’ delicious I tell you (see my KURA Nutrition review from a few days ago). And when something tastes freakin’ awful, I ‘aint afraid to tell you that either (see my 1st Phorm Vegan review from yesterday). So yeah I went into this review with a fairly open mind. If you are curious what Perfect KETO Perform tastes like, I’m about to tell you. Perfect KETO Perform tastes quite a bit like a super-bitter detergent of some kind. Yes. You read that correctly. This product does NOT taste all that great. It has some very sharp notes that just can not be hidden by the stevia that they used to sweeten it. I really found the flavor to be tough to swallow. But all of that can be forgiven if the product WORKS, am I right? I think so. Let me tell you if it works. Does Perfect KETO Perform Work? I have tried this KETO pre workout a handful of times now, and quite frankly I was not blown away with the performance. And maybe that’s because I’m constantly eating. Therefore maybe my body just like, is never IN a ketogenic state. I have always had doubts that these types of ‘exogenous’ ketone products can actually flip a switch and throw your body into a state of ketosis…but maybe they can? I mean. The last ketogenic product that I tried was the HVMN ketone ester drink and I did feel SOMETHING from that. I felt like I had a little bit of a mental and/or physical boost from it. But. Let’s talk about how Perfect KETO’s product worked for me. I tried it about 20 minutes before a tough cycling class at Equinox. I didn’t feel much of a rush of energy like I do when I use regular pre workouts, but I do think that my endurance levels were slightly higher than usual. I was able to endure a little bit longer than usual, and I also did feel that my maximum power output was pretty good. So from that standpoint, I guess Perfect KETO Perform does WORK, just in a more subtle way than some of these other pre workouts that just fire you up from the start. Let’s talk about the ingredients and what gives it that effect. Perfect KETO Perform Ingredients are Pretty Slick. NOTES: The BHB blend, combined with MCTs, is one of the most innovative KETO energy combinations that you can achieve. That is a really poorly-worded way of saying that Perfect KETO Perform has a really badass formula. In fact, after doing some more homework on Perfect KETO, it seems that they are actually the only ones that can use a combination of BHB and MCT together in a formula. They have a patent on it or something. But that is the engine of the product. You have a little bit of caffeine in here as well but the engine is the combination of BHB and MCT. Interesting to note that there is also some traditional creatine monohydrate included as well. Overall this formula is pretty awesome. It’s definitely the best ketogenic pre workout that I have ever tried (probably the only one too LOL). I give the formula a 9/10. Very solid. Speaking of solid- Perfect KETO packaging looks pretty awesome. Perfect KETO Packaging is Fabulous. I have, am, and always will be a sucker for this ‘Miami Blue’ shade on the Perfect KETO label. 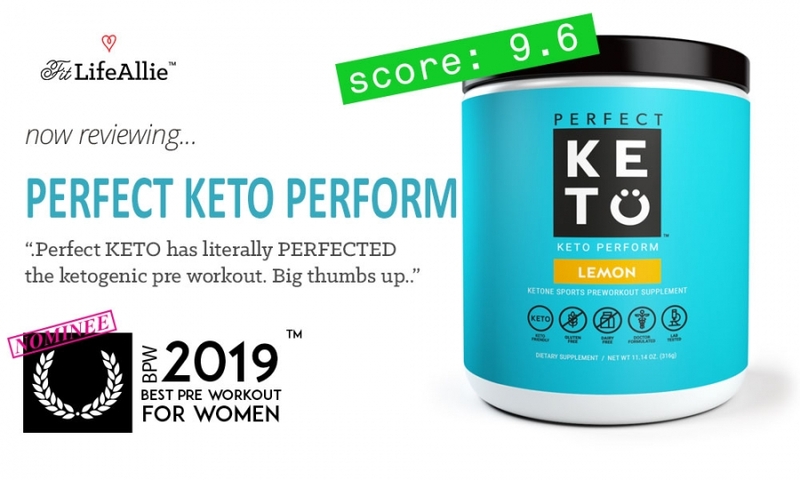 Perfect KETO has such nice-looking branding to begin with that when they use awesome colors on their product, they truly have a home-run. That’s what Perfect KETO Sports Drink/Pre Workout is to me no aesthetics, and well, I guess overall with the exception of the taste it is very much a home run. Maybe an ‘in-the-park’ home run just because that flavor COULD be better. Okay. Now. What else. I mean on packaging it’s the color, the layout, the typography. It all works together nicely. I like the icons that they use to convey different product specs, to cut down the clutter of some of the taste. Perfect KETO always does a really nice job on the packaging. But let’s move along now to the review summary and come to a final conclusion on this KETO pre workout. I tried Perfect KETO Collagen Protein. Here's what I found..